What do dolls have to do with yoga? Not a whole lot, although Valentina* here is doing her best (considering she is made of vinyl and plastic, not muscle and bone) to demonstrate Sukasana (“easy seat,” ie, a comfortable cross-legged position, preferably with knees below the hips). Doll collecting is another passion of mine. I’ve written hundreds of articles about dolls for collector magazines, beginning in the 1980s. I have also written three books about contemporary dolls. These handsome hard-cover books, listed below, have gorgeous pictures of dolls and make great gifts! The books are available through my publisher, Reverie Publishing Company, at doll shops, and through Internet sellers such as Amazon. 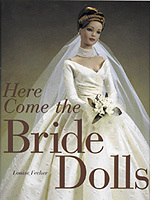 Here Come the Bride Dolls is also available through me, signed, for $22 plus shipping. If you would like to order a copy, contact me at louise@yogabright.com. This book was published in 2004 and is a detailed biography of a young and vibrant maker of intriguing one-of-a-kind dolls. 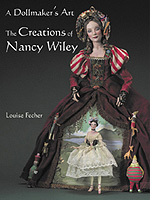 I have met and interviewed many outstanding makers of contemporary art dolls, and Nancy Wiley remains one of my favorites. Her work is fascinating and so is her story. Her fantastical figures have been exhibited in art galleries and museums, and are so cool-looking that Demi Moore (a collector of the artist’s work) dressed up as one for a cover of George magazine in 1996. 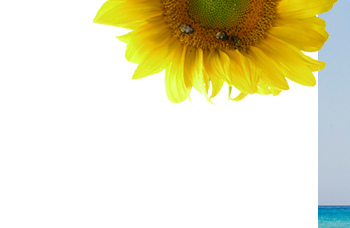 Check out Nancy’s work at her Web site, www.nancywiley.com. 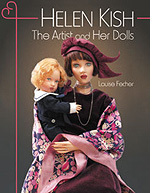 Published in 2006, this is a biography of another favorite dollmaker of mine. In the 1970s, Helen Kish began making porcelain dolls depicting adorable children. Over the years, she honed her skills (her work quickly became more refined and realistic), creating an impressive variety of dolls. Her repertoire includes evocative, one-of-a-kind art pieces in diverse media, including bronze and stoneware. In 1991, Helen founded her own company to manufacture vinyl dolls as well. She is one of the most popular and beloved dollmakers working today, and a real sweetheart to boot. To see Helen’s work, visit Kish and Company. 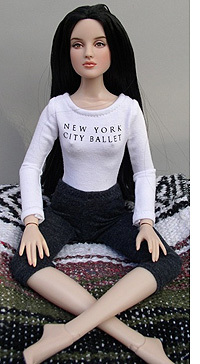 “Valentina” is a customized, one-of-a-kind version of the Antoinette doll produced by Tonner Doll Company. Valentina was handpainted by the Korean artist Yu.